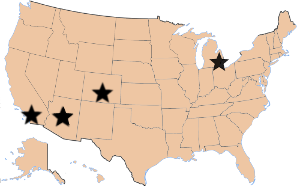 Muscular Moving Men provides state of the art air cooled secured storage for short or long term needs. Choose the trained professionals to do more than just deliver a storage box to your home. Storage starts at $60/month and your first month is 50% off. We provide full service professional storage solutions. We do more than just drop off a box for you to fill. 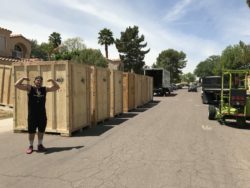 We can also provide professional movers to fill our 5x7x7 vaults and store them in our air cooled secured 20,000 square foot facility in Phoenix, AZ. Concerned about damage? Not a problem when you store with MMM- Our 5x7x7 storage vaults are delivered to your home, office or apartment, loaded onsite and your items stay professionally padded the whole time. With MMM your items go in and out of the storage vaults one time! 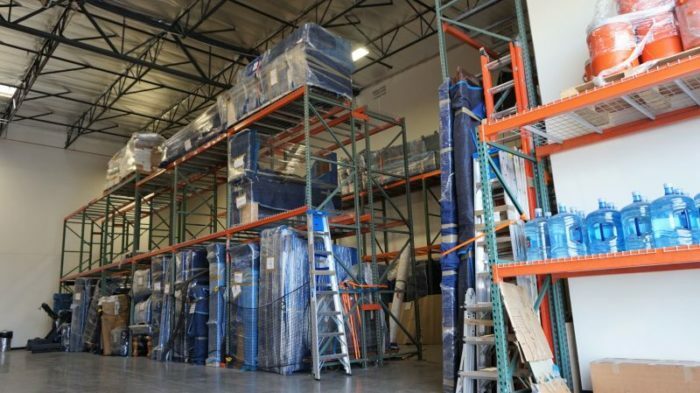 With more than 500 storage customers in our facility, MMM has proven to be the leader in Moving & Storage in Phoenix, AZ. Is having storage containers brought to your home important? MMM uses flat bed trailers to transport secure storage containers. Our well trained and friendly staff will meet with you, take a walk through and understand exactly what needs to be stored. The team will inventory your items to help keep close track of your shipment. The items are carefully padded and shrink wrapped then loaded directly into the 5x7x7 vaults. Once your load is complete and safely inside the storage vaults, the MMM team will drive your items back to our facility to be safely placed in our air cooled warehouse. Storage vaults are what moving companies use to store your posessions. the 5x7x7 units can typically hold about 1 room worth of contents or 1,000lbs. A vault has a pallet at the base which allows a forklift to pick it up and maneuver easily and safely. Securing clamps hold the vault closed once it is full and and a catalog system is used to locate the vault once placed inside our facility. In the event that some of your items are larger than 5x7x7, they would be stored on our secure over sized rack. Each item is billed for on a monthly basis the same as a vault and it is cataloged into our system. When most people think of a moving company storage, they envision a dirt lot, dirty moving pads and a bunch of old trucks packed into a parking lot. When you visit the high tech facility at MMM Headquarters you see what high quality storage you can count on is really all about. Our 20,000sf facility is equipped with key card access and security cameras. Our head of warehousing and moving team will ensure the highest safety to your possessions while stored with us. Not only is our head of warehousing a certified forklift operator, he is a certified trainer. The MMM team conducts weekly safety checks to ensure that all of our customer items are being securely stored. With more than 500 storage containers and customers its no wonder why our customers put their trust in us time and time again. The expertise and attention to detail that the whole MMM staff handles moves and storage with will show you why we are the strongest name in moving. 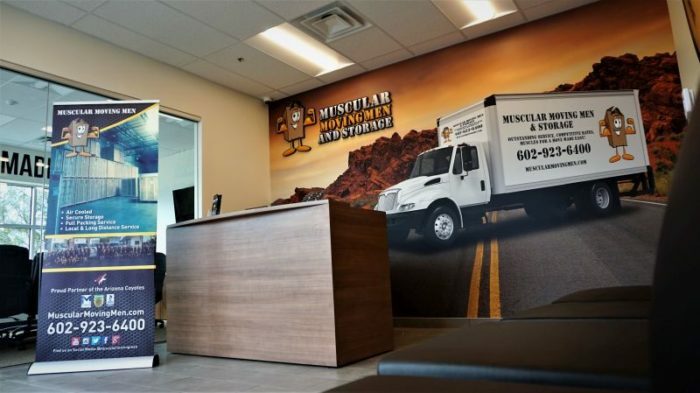 When you need moving storage services, contact Muscular Moving Men at 602-923-6400. With us, you can have peace of mind that the services you receive are just what you need.